Art lovers will be thrilled to learn that more and more public art is popping up around Santa Clarita. It’s a unique, must-see attraction that you’ll likely want to remember long after you’ve returned home. That’s why we’re inviting you to take our public art photo challenge. It’s easy. Simply see how many pieces of public art you can find around town, snap a photo and cherish the memory forever. If you share it on social media, don’t forget to tag #SantaClaritaArts! The Old Town Newhall Arts & Entertainment District, the center for arts activity in Santa Clarita, is the perfect place to start your photo challenge. If you need some food before you begin, stop into Egg Plantation, a popular breakfast spot that features artwork on its walls. As you leave feeling nourished, walk one block over to Main and 9th Street where you’ll find a mural by DALeast, the famous Chinese-born street artist whose paintings feature thousands of brush strokes designed to look like metal shards that come together to form beautiful shapes. His unique style of art can be found in locations such as Paris, New York, Vienna, Berlin and right here in Santa Clarita! Take some time to enjoy the piece, as you won’t find DALeast’s work anywhere else in the Los Angeles area. Now it’s time to imagine yourself on a horse gallop ing back in time as you head down Main Street to find the three murals that reflect Santa Clarita’s strong Western heritage. “Vaqueros” by Nicole Ponsler is a depiction of the early working cowboys who were known for their unparalleled skill in tending cattle. Directly across the street sits the “History of Santa Clarita’s Southern Hotel” by Frank Rock, a mural depicting what was known as the finest hotel south of San Francisco until it burned down in 1888. A couple blocks south is the “Walk of Western Stars” by Victoria Sulski and Peter Bartczak. This mural depicts the rich Western movie history in town. While you’re walking around town, keep an eye out for trash cans, even if you don’t have anything to throw away. On Main Street, between Lyons Avenue and Fifth Street, trash cans have been transformed into “Art Cans” by local artists. Each of these unique works is based on either the “History of Santa Clarita” or the “Street as an Art Gallery” theme. As the sun starts to set, don’t think your trip to the Old Town Newhall Arts & Entertainment District is over. There’s so much more to off er in this part of town, so head over to Coffee Kiosk for some espresso or another roasted treat to revive you. This local favorite used to serve its drinks only from drive-thru kiosks around town before opening an artsy hang-out spot right across from the Newhall Metrolink station. Once the afternoon sleepiness is long gone, you can look forward to an evening at one of the many arts venues in the area. The MAIN offers a variety of entertainment options including theater and comedy shows as well as an exhibit featuring a different artist every month. Shows and exhibits can also be found at other venues in the area, including the Santa Clarita Artists’ Association Gallery, ARTree Community Arts Center, the Canyon Theatre Guild and even the Old Town Newhall Library. For the second day of your public art photo challenge, you can start on the other side of the valley at The Santa Clarita Transit Center, the hub of public transportation for the City. There you’ll find “Archways” by Mark Grieve and Ilana Spector, a sculpture designed to enhance life’s daily rhythms while also beautifying a community hub. Once your rhythms are set, you’ll be in a great mood to see more art. Your next stop is just across the way at Westfield Valencia Town Center, where you’ll find “The Climbing Tre e Bear” by Corey Stein, one of several art bears that grace sites around the city. The bear is a life-sized replica of a California Grizzly Bear, which was once known to call the Santa Clarita Valley its home. If you haven’t had breakfast, stop in for some savory or sweet crepes at Crepes de Paris, the cute French-style café at the mall. You can also roam around outside and try to find the lifelike bronze sculptures blending in with other shoppers. If you decide to go inside, you’ll get a bonus to your tour with two art exhibits. Art Spaces near the food court is a rotating exhibit that features professional artists while the Community Wall near Sears showcases the work of student artists and other community groups. As you leave the mall, head over to the corner of McBean and Newhall Ranch Road. 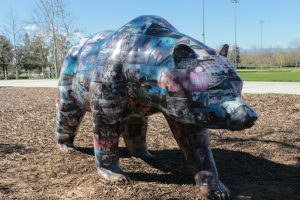 On one corner is Heritage Park, where you’ll find “The Heritage Bear,” designed by local artist Scott Groller and featuring a photographic collage of City history and events. On another corner, you’ll find Bridgeport, a shopping center with a small lake and a sculpture by Douwe Blumberg featuring 65 cast aluminum birds rising from the lake surface to over 17 feet in the air and set amongst several sails. You may be able to find some real winged friends to pose for your picture here as ducks and geese are known to be fans of this particular art piece and its locale. If you still have art on your mind but are looking for some nourishment, stop in for a bite to eat at Marston’s, another popular restaurant that features artwork on its walls. As you make your way to Central Park, you’ll go from birds to butterflies with LT Mustardseed’s The Western Tiger Swallowtail. This large butterfly sculpture, along with the yerba santa plant next to it, is constructed entirely from steel recycled parts. This is one butterfly you can count on to stay still for a picture. 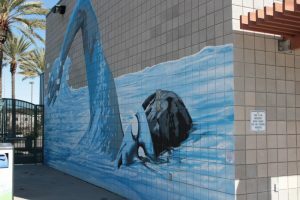 Now it’s time to let go of your wings and discover your fins at the City’s Aquatic Center, where yo u’ll find two murals — Into the Blue by Rachel Slick and The Final Lap by Bob Hernandez. If you’re visiting in the summer, you might want to spend the rest of your afternoon right here tackling the 160-foot water slide. Whether you choose to get wet or not, take a little time to roam around and find the five “Art Cans” located around the Aquatic Center and Sports Complex grounds. To finish your art tour and learn how we all connect with the arts, make your final stop under the Newhall Ranch Road Bridge at Soledad Canyon, where you’ll find “Connecting Through the Arts.” This mural was designed by artist Marc Kolodziejczyk and Nicole Armitage and was a collaborative effort among 395 students with special needs and mainstream students from four schools within the Santa Clarita Valley. For more information on art in Santa Clarita, visit SantaClaritaArts.com.